Evelyn M. Scheckel died on Wednesday, September 19, 2018 at the Richland Hospital in Richland Center. She was born on December 24, 1925 in the Township of Eastman to Anna M. (Heisz) and Joe C. Morovits. She was a graduate of Seneca High School and the La Crosse Teacher College. She taught in three one-room schools throughout Crawford County and the Wauzeka-Steuben Public Schools. She married Virgil M. Scheckel on June 8, 1948 at Saint Wenceslaus Church, Eastman. He preceded her in death on March 26, 1984. The two of them farmed in the Township of Wauzeka their entire married life and the farm remained Evelyn’s home until 2017. 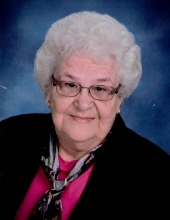 Evelyn was an active member of Sacred Heart Catholic Church, Wauzeka serving as a member of the pastoral council, president of the Parish Council of Catholic Women and the Prairie du Chien Deanery Council of Catholic Women. She was civically active as a member of the Wauzeka Public School Board, the election board and the Cemetery Association. She worked as a part-time housekeeper for her priest son at the parish rectories of Saint Mary Ridge, Cashton and Saint James the Less, La Crosse. In her later years she enjoyed traveling in the United States, to Canada, Mexico and Europe. She is survived by her five children, Michael, of Wauzeka, James (Irene), of Chicago, Mary (Harlow) Heintz of Poynette, Reverend Monsignor Roger of Richland Center and Therese (Dean Amundson) of Richland Center; five grandchildren, Ted (Marie) Scheckel of Little Rock, Ark., Anna (Kevin) Denn of Woodbury, Mn., Robert (Kaitlyn) Heintz, of Poynette, Christine (Jessie) Dowding of Madison, Francessca Scheckel of Hilo, Hawaii, and four great-grandchildren. She is further survived by two sisters, Hazel Meoska, of Bloomington, WI., Adeline Stoehr of Seneca, two brothers, Donald and Allen (Gloria) Morovits of Seneca, sisters-in –law, Fern Schmaltz, La Crosse, Elizabeth Scheckel, Soldiers Grove, Dolores (John) Stern, Shippensburg, Pa., Beverly Scheckel, Norfolk, Va. Charlotte Scheckel, Anamosa, IA., brother-in-law, Vincent Sweeney, La Crosse and many nieces and nephews. She was preceded in death her by her parents, husband, two brothers, Roy and Harry (Joan) Morovits, one sister, Mary RIgdon and several brothers and sisters-in-law. A Mass of Christian Burial will be celebrated at the Assumption of the Blessed Virgin Mary Church, Richland Center at 11:00 a.m., Monday, September 24 with a visitation before the Mass beginning at 9:30 a.m. Monsignor Roger J. Scheckel will officiate. A visitation will take place at 2:00 p.m. at Sacred Heart Catholic Church, Wauzeka, with the rosary prayed at 3:30 p.m. followed by burial in the Wauzeka Cemetery. The family is grateful to the Good Samaritan Home, Fennimore, Pine Valley Community Village and Richland Hospital, Richland Center for the good care they provided for Evelyn. Online condolences available at www.staffordfuneralhomes.com. The Stafford Funeral Home in Richland Center is assisting the family with the arrangements. "Email Address" would like to share the life celebration of Evelyn M. Scheckel. Click on the "link" to go to share a favorite memory or leave a condolence message for the family.